During the last months more and more death metal bands from Denmark step into the limelight. So, what's different? What can Koldborn offer? The Danish quartet is calling their music Groove'n'Grind and they are not the typical death metal band which gets obvious if you listen to the album opener Of Sins Sublime. The track has parts which are unusual for death metal and so if you are looking for old-school death metal, this might be not your cup of tea. Beside that the foursome thinks that lyrics are important and so they leave the typical lyrics behind. Wicked Arise Divine for example is about the organized religion. The band doesn't see them as a satanic band and if you read the lyrics it's obvious. On In Breathless Sighs they use a female voice as the counterpart to the growls of Martin. Also the track has slow, very melodic parts where Hendrik's guitar is very emotional. Some songs are already known, coz they were released on their demo release in 1999. Blessed By Beyond was first released on tape and soon was sold-out, so the band re-released it on CD limited to 50 copies which were sold-out soon. 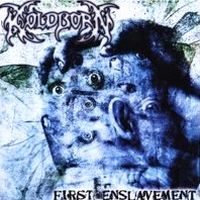 At all I can say that First Enslavement is an quite interesting piece of extreme music!